Aging: It’s not just for wines, whiskeys and people who aren’t me. So I’ve decided to take the next step in my beer appreciation learnings and start doing what I’ve wanted to do ever since I tried some beer that had undergone this process. I’m going to start aging beer. I think my first instance in trying some aged beer was at Dogfish Head’s brewpub, where I had a World Wide Stout that had been aged for one year and…dear LORD, it was amazing. Ever since then I’ve been thinking about it. Last week, when Amsterdam Brewery released Tempest Imperial Stout (a delicious one-off originally brewed last year) I decided to buy a few to be the first test subjects in my beer cellar. Lucky thing I got them too, as all 1400 bottles produced sold out within two days. Also, thank heavens, I was able to get the last Muskoka “Winter Beard” Double Chocolate Cranberry Stout from Muskoka Brewery’s retail store. 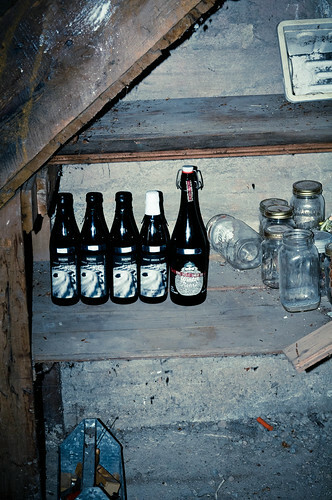 – The beers have to be stored at a cool 10-20°c in a dark, semi-dry room. A basement, garage or cave will do in a pinch. A closet for apartment dwellers also works. – The beers have to be bottle-conditioned, which is to say that there are active yeasts in the bottles allowing the beer to further ferment. – Beers heavy in malts like Stouts, Porters, Barley Wines and Belgian Ales are best for aging for long periods of time. This makes sense, since the more malts (sugars) the more of a meal the yeasts have which will allow them to do their thing (eat sugar, poop alcohol). – Hoppy beers aren’t that great for aging over long periods of time, as the hops break down after a while and create a kind of skunky, dreadful drink. – The higher the alcohol content, the more benefits the beer will have to being aged. The agreed upon rule seems to be “8% ABV or higher”, although many Beglian beers with low ABV percentages have also benefited greatly from aging. – If the beer contains Brettanomyces, a Belgian yeast that is usually added near bottling time, you’re able to age it. This yeast does a lot in a few months or years (see Goose Island’s Matilda, which can be aged for five years). Having this yeast isn’t needed, this is just a “if you see a beer with this in it, go for it” kind of tip. – While there is some argument on this, it is advised to always store the beer in the upright position rather than on its side. The debate is mainly over how to store beer that has been corked, as laying it on the side will prevent the cork from drying out. Although a way around THAT can be to dip the top of the bottle with wax. You know what, I’ll just leave it to one’s discretion. The advantage of aging beers? Well, there are certain strong flavours in beers that mellow out over time and bring a rise to flavours you may not have noticed before. In Imperial Stouts, for instance, the alcohol bite goes down along with the heavy coffee overtones and presents a sweeter, almost creamier beer. So it highlights complexities to a beer that you didn’t know were there. That’s a good enough reason for me, at any rate. Beers can be aged for years and years too. I’ve heard plenty of stories of people opening a bottle of Chimay from 1986 and even a beer that was discovered to have been stored since 1869! Madness? Probably. Worth it? Most definitely. You can also age beer in things like Oak whiskey barrels to add a wonderful flavour and depth to the beers, but since I’m not Mme. Moneybucks McGee (Of the Southampton McGees), I’m going to discuss bottle aging for now. Right, so now on to my little project. It was easy to pick the location (the basement of my cottage in Muskoka). It’s dark, it’s cold and it’s dry, but not dry enough to give me a nosebleed or chapped lips. It also has shelf space, so if a flood happens down there (Give me a break, it IS a cottage. It happens) then I have no fear of water touching my precious bottles. I also have something covering it, so no burglers will sneak in to the house in the middle of the night and find it. 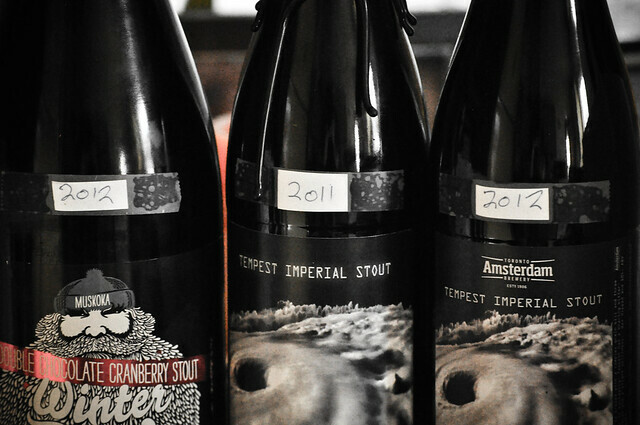 It’s important to label what year your beers are from (see above picture) so you’ll remember. And don’t think you will, because unless you’re some kind of savant or only aging one beer you’ll have at least a bit of difficulty remembering. Just do it that way. To add a fun bit of nostalgia to it, I may also write down a few details of how my life is currently going, so I can look back on it. But hey, do what you want. So now it’s set up in complete, cold darkness and is FAR AWAY from me. I’ll admit, one of my biggest concerns is the will power it takes to just WAIT. Because now I have some fantastic beers in that room and what’s the harm in just having one? See, this is why I chose the cottage. I go up there about 4-5 times a year now, so the chance of me getting to it is pretty minimal. My other biggest concern is how the room will be in the winter time. If it ends up being too cold, I may have to move them. But I guess we’ll cross that bridge when we get to it, eh? So here’s the score with the beers I have on your right. I have three bottles of this year’s Tempest Imperial Stout, which according to the brewer, can be aged for up to three years. One will be aged for one year, another for two and the final for a third year. The Tempest wrapped in a white top has already been aged for a year and a half (came with a six pack of the beer as a gift) and will be brewed for an additional year and a half. If more Temptests come out every year, I’ll be buying some to age. The Muskoka Winter Beard will be aged for a year. There is also a plan to age some Old Rasputin Russian Imperial Stout, Goose Island Matilda and Dogfish Head World Wide Stout. We’ll see how those go. Regardless I am going to try to have at least three beers in there at any given time for several years. And that’s that. If any of you readers have suggestions for beers to age, I’d sure appreciate it! If I can get a hold of it, I’ll try! best deal- La Trappe Quadrupel $6.45 for 750ml – @10% !! Lose it for a year-ish……. I’ve been meaning to try that, actually!